President Donald Trump speaks during a campaign rally at the Landers Center Arena, Tuesday, Oct. 2, 2018, in Southaven, Miss. President Donald Trump says social media is “my form of telling the truth.” In fact, there are many well documented examples of Trump — as a candidate and as president — spreading false information on Twitter. Trump made his remark in an Oct. 29 interview with Laura Ingraham on Fox News. Ingraham asked the president “how does it help America heal” to call the media the “enemy of the people.” She recalled how President Ronald Reagan responded differently to media criticism. There are dozens of examples of Trump not “telling the truth” on social media — including retweets that spread false information from dubious sources. Can President Trump End Birthright Citizenship? If President Donald Trump tries to end birthright citizenship, a legal battle is likely to take place. As a candidate, Trump retweeted a bogus graphic purporting to show the percentage of whites killed by blacks and other homicide data by race. But almost every statistic was wrong — some grossly inaccurate. For example, the graphic said “whites killed by blacks 81%.” The actual figure was 14.8 percent, based on homicide data available at the time from the FBI’s Uniform Crime Reports data, for 2014. Here we offer just a dozen of Trump’s false and misleading tweets that we have written about since he became president. Trump tweet, Feb. 3, 2017: Thank you to Prime Minister of Australia for telling the truth about our very civil conversation that FAKE NEWS media lied about. Very nice! The media did not “lie” about Trump’s conversation with then-Prime Minister Malcolm Turnbull. The WashingtonPostwrote an accurate account of the phone call in a Feb. 2, 2017, story, based on interviews with unnamed “senior U.S. officials” — an account that was verified six months later, when the newspaper obtained a transcript of the call. Trump tweet, March 4, 2017: Terrible! Just found out that Obama had my “wires tapped” in Trump Tower just before the victory. Nothing found. This is McCarthyism! This was one of several tweets on March 4, 2017, making unsubstantiated claims about Obama. In his tweetstorm, Trump accused Obama of illegal acts, which he compared to Watergate. But there was no proof at the time and there still isn’t any that the former president violated any laws. Then-FBI Director James Comey on March 20, 2017, told the House Permanent Select Committee on Intelligence that the Department of Justice and the FBI had no information to support Trump’s tweets that the Obama administration wiretapped his phones at Trump Tower. Trump tweet, March 7, 2017: 122 vicious prisoners, released by the Obama Administration from Gitmo, have returned to the battlefield. Just another terrible decision! This could not be more wrong. Trump was referring to 122 released Gitmo prisoners who were “confirmed of reengaging” in terrorist activities. But the vast number of those prisoners who were “confirmed of reengaging” — 113 of the 122 — were released or transferred out of Gitmo by President George W. Bush. So this wasn’t a case of “another terrible decision” by Obama. Trump tweet, July 25, 2017: Problem is that the acting head of the FBI & the person in charge of the Hillary investigation, Andrew McCabe, got $700,000 from H for wife! Twice in two days, Trump falsely tweeted that acting FBI Director Andrew McCabe’s wife received $700,000 in campaign donations from Hillary Clinton. This was one of those tweets. The facts: For the November 2015 election, Jill McCabe’s campaign received $467,500 from Common Good VA, a political action committee controlled by then-Gov. Terry McAuliffe, a close friend of the Clintons, and another $207,788 from the Virginia Democratic Party. There’s no evidence that Clinton had any say in the contributions to McCabe’s campaign or even knew about them. Also, McCabe wasn’t the only candidate to receive significant contributions from McAuliffe’s PAC that year. Common Good VA gave $803,500 to state Senate candidate Jeremy McPike, who won his race, and $781,500 to Daniel Gecker, who lost his. These donations were all part of a failed effort by the Democratic governor to help the Democrats take control of the state Senate that year. Trump tweet, Jan. 18: We need the Wall for the safety and security of our country. We need the Wall to help stop the massive inflow of drugs from Mexico, now rated the number one most dangerous country in the world. If there is no Wall, there is no Deal! Mexico is not “rated the number one most dangerous country in the world.” Homicide rates were higher in numerous other countries in that region — let alone around the world. 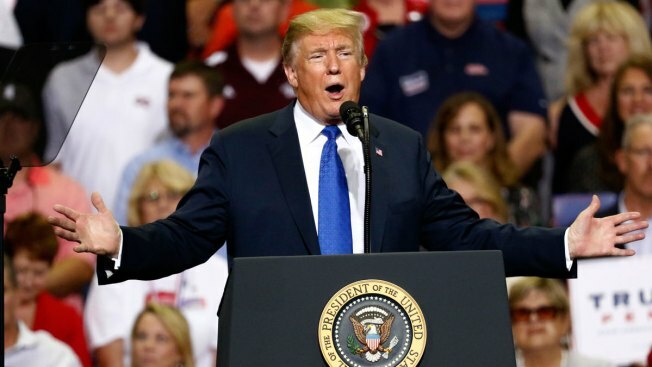 Also, Trump says a border wall will “help stop the massive inflow of drugs from Mexico,” but experts doubt it because most illicit drugs come into the U.S. hidden in cars, vans and tractor trailers that drive undetected through legal ports of entry. Trump tweet, Feb. 18: I never said Russia did not meddle in the election, I said “it may be Russia, or China or another country or group, or it may be a 400 pound genius sitting in bed and playing with his computer.” The Russian “hoax” was that the Trump campaign colluded with Russia – it never did! Early on, Trump repeatedly said Russia was not to blame for the cyberattack on Democratic organizations and officials. Later, Trump cast doubt on Russia’s involvement even after the U.S. intelligence agency concluded that Russia had interfered in the 2016 presidential election to help him win the election at President Vladimir Putin’s direction. In a Sept. 8, 2016, interview that airs on RT, formerly known as Russia Today, Trump said it is “pretty unlikely” that the Russian government was behind the hacks targeting the Democratic Party. Trump tweet, March 5: We have large trade deficits with Mexico and Canada. NAFTA, which is under renegotiation right now, has been a bad deal for U.S.A. Massive relocation of companies & jobs. Tariffs on Steel and Aluminum will only come off if new & fair NAFTA agreement is signed. The U.S. actually runs a small trade surplus with Canada, and the deficit with Mexico isn’t all that large, relatively speaking. The U.S. had a trade surplus in goods and services of nearly $2.8 billion with Canada last year, according to the U.S. Census Bureau. As for Mexico, the U.S. did have a total trade deficit with its southern neighbor of nearly $70 billion last year. But that amounted to just 11 percent of total two-way U.S. trade with Mexico. By contrast, the total trade deficit with China amounts to 47 percent of the total trade between the two countries. Trump tweet, March 17: The Mueller probe should never have been started in that there was no collusion and there was no crime. It was based on fraudulent activities and a Fake Dossier paid for by Crooked Hillary and the DNC, and improperly used in FISA COURT for surveillance of my campaign. WITCH HUNT! There was much wrong with this one tweet — which was only one of a tweetstorm about the Russia investigation that contained numerous false and misleading claims. In his tweet, Trump said “there was no crime,” but at the time of Trump’s tweet Mueller had found evidence of crimes contained in five guilty pleas and two indictments. Trump also claimed that the “Mueller probe” was “based on … a Fake Dossier,” referring to opposition research conducted by former British spy Christopher Steele. However, the probe started after an Australian diplomat informed the FBI that Trump foreign policy adviser George Papadopoulos told him that the Russians had “dirt” on Hillary Clinton. There is also no proof that the Justice Department “improperly used” the Steele dossier when obtaining a court-approved warrant to monitor the communications of Carter Page, a former Trump foreign policy adviser, and the FISA court did not approve surveillance of the Trump campaign, since Page had taken a leave of absence from the Trump campaign a month before the warrant was approved. Trump tweet, April 1: These big flows of people are all trying to take advantage of DACA. They want in on the act! Trump’s referring here to a caravan organized in the spring by the activist group Pueblo Sin Fronteras (People Without Borders), which says it provides humanitarian assistance to migrants and refugees, and works for their rights. At the time, it numbered about 1,150 people, although only 158 of them were ultimately admitted into the U.S. to apply for asylum. But the “big flows of people,” as Trump called them, cannot “take advantage of DACA,” contrary to the tweet. In fact, no new border-crossers are eligible for the Deferred Action for Childhood Arrivals program. Among other requirements, DACA applicants had to be physically present in the U.S. on June 15, 2012 and living continuously here since June 15, 2007, in order to qualify for the program. This was one of several tweets about immigration on April Fool’s Day that were false or misleading. Trump tweet, June 11: I am in Brussels, but always thinking about our farmers. Soy beans fell 50% from 2012 to my election. Farmers have done poorly for 15 years. Other countries’ trade barriers and tariffs have been destroying their businesses. Farmers have not “done poorly for 15 years.” It’s been five years. Soybeans did decline sharply since 2012, but not because of “trade barriers and tariffs.” It was because of weather-related supply and demand: a severe drought in 2012 reduced supply and increased prices to record levels in the 2012-13 season. Trump is referring to the federal indictments of Republican Reps. Chris Collins and Duncan Hunter Jr., in August. But they were not “long running, Obama era, investigations,” as Trump tweeted. The Collins investigation started five months after Trump took office. The Obama administration had nothing to do with it. As for Hunter, the investigation started under Obama but it lasted longer under Trump. Trumptweets, Sept. 13: 3000 people did not die in the two hurricanes that hit Puerto Rico. When I left the Island, AFTER the storm had hit, they had anywhere from 6 to 18 deaths. As time went by it did not go up by much. Then, a long time later, they started to report really large numbers, like 3000……..This was done by the Democrats in order to make me look as bad as possible when I was successfully raising Billions of Dollars to help rebuild Puerto Rico. If a person died for any reason, like old age, just add them onto the list. Bad politics. I love Puerto Rico!